Albert “Funnybone” Harris travels the country sharing jokes, roasts and his testimony to a variety of audiences with physical comedy and realistic imagery! In 2002, Funnybone started studying comedy at the Comedy Zone under the leadership of Fred Pozin in Jacksonville, FL. He grew up loving Richard Pryor and Eddie Murphy. He used to feel foul language was like seasoning to his jokes. Today, though, his goal is to bring joy to audiences – but without using foul language. He spearheaded “The Clean Kings of Comedy Show” and is a co-host of the Working The Word TV Show. FUNNYBONE performed on the Holla! Comedy Tour, the TDI Gospel Jamz Tour 2011 & The Tour That Angie BEE Presents. Who says Christian comedy can't be fun?!? Funnybone was a great mix of comedy and class. We wanted a comedian who could entertain our diverse (age,gender,race and culture) audience. Funnybone did just that. Young and old were thoroughly amused. He was timely and reasonably priced as well. All of our guests were cracking up and happy after his set. I am especially appreciative of Funnybone's willingness to work with our group to make a show that was a perfect fit for and elegant affair bit still lighthearted. We will definitely be asking him back to future events. Hilarious… I laughed so hard that my side is hurting… He had me crying… Are just a few comments we received after the comedian, FunnyBone, performance at our Pastor’s birthday brunch. At her birthday brunch, we had a very diverse audience, Chief Apostles, Bishops, Apostles, Prophets, etc., and FunnyBone had all of them laughing and wiping away tears. He was able to cater to his diverse audience and we highly recommend FunnyBone for your next engagement. Comedian Funnybone was absolutely awesome. He gave us a great show. He was hilarious. Everyone was cracking their sides with laughter from start to finish. He kept it real. We truly enjoyed the Funnybone Experience. Can't wait until our next event with this great man of God. I felt so blessed when I requested Funnybone to be the Emcee for my sister's wedding reception, and he agreed to do so. From the first time we conversed on the phone, he was energetic, supportive, and humorous. The bride, groom, and guests enjoyed his personality and jokes. He shared his God-given gift of comedy and kept us engaged! Congratulations on a job well done! He is definitely a great Emcee and person. Don't hesitate to book Funnybone for your next event! I have hired several Comedians for my events in the past, but Funnybone ranks #1. He lit it up for my family members at our June 2018 family reunion. My family still talks about him weeks after the event. We had over 110 family members at the event. He's very funny and he's a clean comedian. He kept in contact with me leading up to our event. He's very professional. He was like a brother. He really related to my family and they related to him. I will 1000% back Funnybone performance at any event. Hire this gentleman....you want be disappointed. Funny Bone Harris Exceeded My Expectation! Wow, I never met this comedian before the night of my event. I needed someone who could deliver and ensure my event was successful. I never gave a speech before and I wanted to ensured my message got out. I am more of a behind the scene person. I became more part of his performance and my event. I am still in awe about how that transpire so effortless. I had fun and it was nice to loosen up and be me! Yes, FunnyBone kept me engaged with my audiences and when it was my time to speak, I so with no problems. He delivered big time and is very gifted! Very easy to work with and has a lovely supportive wife! After the event, I received several calls stating to make sure he host all our events. Mr Harris delivers in a super big way. He is bigger than life. Bam! He made me look great! I am so pleased with his service and the outstanding success of my event. I more than highly recommend his service. So, when he says, he got you, relax and leave the driving to him. His pride in his work shows. We will do it again Mar 9, 2019. Thanks FunnyBone, you kept us laughing up a storm and everything we accomplished what we needed. Thanks again for blessing our organization. We hired Funnybone as our comedian to celebrate our vow renewal and our 10th anniversary. Our guests were please with the performance and so were we. He also shared some encouraging words with my husband and I. He was polite, punctual and professional. Funnybone had everyone laughing & enjoying the banquet. Our Pastor & his wife really enjoyed his comedy!! He is truly blessed with a gift!! Funnybone performed at our Family Reunion in Orlando and was Outstanding.
" Exceptionally Funny", "Hilarious". Definitely a " Crowd Pleaser " liked by all ages. Family couldn't stop laughing. Be on the look out for the Next Big Star. He's getting ready to Blow Up on the Comedy Scene. Entertainment for all ages, Everyone loved him! I hired Funnybone for our family reunion and he was amazing! He engaged with the crowd and had everyone dancing old school vs New school. He had everyone on there feet laughing and dancing. He is truly talented. And he was dressed to impress in our theme colors. Thank you Funnybone you were great! You won't be disappointed.... Great! I hired Funnybone for my vow renewal in Sarasota last year. I hate that I am just now getting around to do a review. He was very professional and gave a awesome set , that all my guest enjoyed from young adults to old. Hello Britttany. Thank you so much for the review. Fell free to visit my new website at funnyboneharris.net. . Have a Great night. What a wonderful kickoff to our conference weekend. Funnybone hosted the opening night of the youth conference at my church. When we decided to bring in a Christian comedian, we immediately sought out Funnybone. We heard that he was the best, and he did not disappoint. The kids kept telling us how much they enjoyed the event. What a wonderful kickoff to our conference weekend. We look forward to having him at our conference again next year. Funnybone is funny, professional, and personable. I highly recommend him for any event. FUNNYBONE did two events at our campus at the last minute and was amazing! He was flexible, professional and hilarious! He kept the crowds hyped and made them laugh in between acts. He and his wife are also the sweetest people! I will definitely be using his services again and also referring him to other organizations on campus! Thanks for doing an outstanding job! Funnybone is off the chain! He is funny, exciting, fresh and most importantly he brings the message of Jesus Christ the humor! He's awesome! I have seen Funnybone perform on many occasions and everytime he warms my heart. He keeps me laughing while encouraging me with the lessons of life through his comedy. He's such a genuine person and he loves God. Funnybone is truly a motivational speaker with the use of comedy and I thank God for him and his gifts. Truly hilarious and a must see, never dull moment and you won't regret it! I Have Seen Funnybone Performe Severt Time, And He Was So Awesome!! !.I Enjoyed Funnybone, I Haven't Laughed So Hard In A While Since I Heard Him. He's Amazing, And A Wonderful Man Of God. I have seen Funnybone perform several times at many different events. The ones that stick out to me is when he comes to our church and perform. He has performed at one of our church anniversary and he has performed in our Beauty for Brokenness women's group. He has also hosted my birthday celebration and it made a HUGE difference with him being there to bring laughter to the event. This guy which is also my cousin is so HILARIOUS!!! He kept us laughing!!! Not only is he FUNNY but he is very touchable meaning he is a people's person! He loves people and all he wants to do is be a blessing to people! He is also very humble and he doesn't mind serving God's people and blessing them with laughter!!! Keep up the good work cousin!! Love you! Apostle Mary. We really enjoyed having Mr. Funnybone host our 2nd Annual Stop the Violence event!! He kept everyone laughing and grinning from ear to ear!!! He is truly an amazing comedian and we look forward to having him at our next event! Scholastic Sports, Inc "Cheerful Giver Dinner"
We thank God for "Funnybone" and his talents. This evenings was spectacular. Christian people having laughter and fun in nice environment. I encourage any Christian who wants a nice spiritual laugh to connect my brother and friend. He will do your heart good! God Bless you Women of God..... We truly had a blessed time and Funnybone and myself have been talking about you and your Church Family often since we meet.. Thank you for such kind and warm words and we take no Glory, we give all the Praise, Glory and Honor to our God.... We are so looking forward to fellowhshiping with you all again. Tell everyone that we said Hello and that we love you all. I can't thank you enough funny bone for being the God gifted entertainer that you are. You really looked out for me and our foundation. Everyone really enjoyed your performance. I really want to thank you for taking the time to talk to me - I was so nervous about everything and you helped me calm down and just enjoy the event. You didn't have to do that. Event staff counseling isn't part of your job description, I'm sure. LOL. Much respect, Tenman and The Duval Artist Coalition. From the very beginning of the initial contact everything has been nothing less than professional. The evening was a night to be remembered always, everyone had an excellent time FunnyBone was funny. The entire routine was on point and relevant to the crowd. I highly recommend this for your next event. We are looking forward to future endeavors. Hay, no doubt, Funny Bone will have you crying. I have had the pleasure of seeing him on more than one occasion, and he always has fresh material. I love how he makes me see the funny side of life. He is in his own lane... Oh and dude stays sharp. You gotta love the suites. I wanna kidnap his taylor.... lol! Funnybone has performed at events for our church in Cocoa, FL on several occasions and always brings something fresh and wildly entertaining. His onstage wit and off stage charm have enamored our congregation to him. Although we don't see him often, he holds a permanent place of brotherhood in our hearts and we are always thrilled to have him back! Hilarious comedian, authentic Christian, and serious family-man. He's definitely the REAL deal! Celebration Tabernacle Church. Funnybone ministered at our church and had people of all ages/backgrounds laughing throughout the whole experience! It was definitely a great avenue to allow God's people to experience a good dose of joy!!! I would highly recommend any church to give the ministry of Funnybone a chance! You will not be disappointed!!! Good clean fun!!!! I was honored with the chance of getting to see this awesome comedian in action at the Laugh It Off comedy show in Tampa, Fl & words can not EXPLAIN how funny this man is! Even though it was a clean/ christian comedy show, he was still hilarious. This definitely goes to show how talented someone is if they can make you laugh without saying anything inappropriate. I also got to meet Funnybone after the show and he turned out to be one of the sweetest people I know. He truly blessed my family and I with his kind words and encouragement. His name definitely fits him well & I hope who ever reads this decides to check him out. He is a wonderful person! Funnybone left it all on the stage at our 1st annual Laugh It Off! Christian Comedy Show on Nov. 30th in Tampa, Fl. He not only gave us a hysterically funny high energy performance, but he also left us feeling inspired and uplifted. The show was two nights ago and my teenagers are still laughing and re-enacting various parts of Funnybones performance! His creativity allows him to find humor in everyday life. His jokes about church, childhood, and relationships left the crowd in stitches! Funnybone is much more than just a Comedian; he is a Minister of Christian Comedy! Wow, what can I say, This comedian was absolute fantastic. He took what would have otherwise have been a mediocre show and made it the hit of the season. A consummate professional, and a truly all around nice guy. You add his Christians values and you now have the makings of a successful program. I am truly grateful for the work that he did. Funnybone rocked the house! He does what he say he will do. Keep the people laughing and bringing quality entertainment. He is funny, confident and can relate to all audience members. Days after the show people are still talking and requesting that Funnybone comes back!!! WE have no regrets in in making him The Headliner! WOW... What an Awesome performance!!! Albert "Funnybone" Harris was truly an awesome performer at our final Centennial event. Funnybone was the talked of our Church for several weeks after the event...everyone in attendance was very appreciative and thankful for the committee contracting him. Funnybone is definitely a first class act and I strongly encourage and recommend this man of God to anyone looking for an exceptional Christian Comedian. I SAW FUNNYBONE AT A ANNIVERSARY PARTY.. I NEVER SEEN A CHRISTIAN COMIC PERFORM BEFORE UNTIL HIM.. HE IS TRULY A BIBLE BASE COMIC THAT MAKES CHURCH LOOKS FUN.. HE IS A COMIC THAT THE WHOLE FAMILY INCLUDING GRANDMA AND PASTOR CAN ENJOY..
FUNNYBONE WAS AT OUR FAMILY REUNION AND HE WAS AWESOME.. THE COMIC BEFORE WAS VERY GRAFIC AND HAD DISTASTEFUL JOKES THAT WAS OUT OF LINE.. WE HAD TO REMOVE THE CHILDREN FRON THE BALLROOM.. WHEN FUNNYBONE CAME UP ON STAGE THE KIDS CAME BACK IN AND GOD DID HIS THING THRU FUNNYBONE.. HE HAD US SINGING AND DANCING AND OFCOURSE LAUGHTING.. HE WAS AWESOME AND HE IS PROOF THAT YOU DONT HAVE TO CURSE TO BE FUNNY... HE TURNED A BAD NITE INTO A GREAT NITE.. I SAW FUNNYBONE PERFORM AT MY PASTOR ANNIVERSARY DINNER AND HE WAS AWESOME.. ITS JOKES TOOK US BACK FROM BEING A CHILD ALLTHE WAY TO ADULTHOOD.. FABULOUS PERFORMER.... LOL.. HIS SONGS ARE VERY VERY FUNNY.. I SAW FUNNYBONE PERFORM AT MY WIFE FRIEND DAISY MOTHERS DAY PARTY.. ITS WAS PEOPLE IN ALL DIFFERENT CULTURES THERE AND FUNNYBONE WAS ABLE TO BLEND IN PERFECT.. HE EVEN TRIED TO DANCE LIKE THE HISPANICS..LOL.. HE EVEN TOOK PICTURES WITH US.. HIS PERFORMANCE WAS AWESOME.. I WITNESS FUNNYBONE AT MY PASTOR ANNIVERSARY PARTY AND FUNNYBONE STOLE THE SHOW.. HE WAS ABLE TO COMMAND THE CROWD THAT RANGES FROM TEENAGE TO THE OLD FOLK.. HE HAD SOME GREAT SONGS HE DOES THAT HAD US DANCING AND LAUGHING.. HE IS ALSO A VERY STYLISH DRESSER..I WOULD RECOMMEND HIM TO ANY CHURCH OR ANYBODY WHO NEEDS A CLEAN COMIC.. I truly enjoyed Comedian FUNNYBONE's performance at Kevin Randolph's birthday party. He was clean and dressed appropriately for the occasion. His jokes were very funny and he incorporated funny things about Kevin into his routine. I would recommend FUNNYBONE to anyone. Sister Debra, thank you for your review. Hope you enjoyed the show! Hope to see you again when I return to your area! Bless you! Hope to see you again in Orlando soon! Thank you for your comments and we look forward to seeing you again soon! I SAW FUNNYBONE PERFORM @ A MENS REVIVAL.. HE WAS OFF THE CHAIN.. 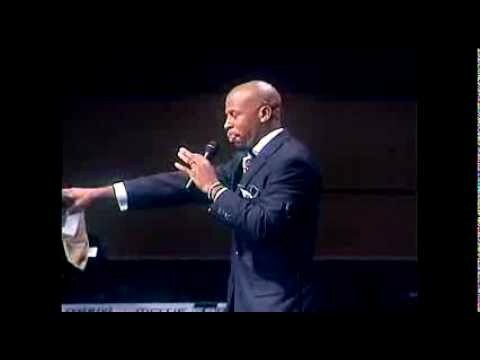 HE HAD US ROLLING ON THE GROUND LAUGHING.. TO SEE A COMEDIAN BE ON STAGE FOR A HALF HOUR WITHOUT USING CURSE WORDS IS AWESOME.. A LOT OF COMEDIANS NEED CURSE WORDS TO BE FUNNY BUT FUNNYBONE WORDS WAS PURE AS WATER AND HE ROCKED THE HOUSE.. YOU HAVE VERY FEW CLEAN COMICS BECAUSE ITS NOT EASY TO DO BUT DOING IT FOR GOD IT WILL BE WORTH IT.. Thank you for your comments. I look forward to returning to your next revival, Lord willing! I SAW FUNNYBONE @ A CHURCH IN PLANT CITY AND I ENJOYED EVERY MINUTE OF HIS PERFORMANCE BUT WHAT I REALLY ENJOYED WAS HOW HE WAS ABLE TO USE HIS TESTIMONY IN HIS PERFORMANCE.. ITS AWESOME HOW GOD WORD CAN GO THROUGH ANYONE.. EVEN A COMEDIAN.. Thank you very much! We look forward to returning to your area, Lord Willing! HE HAD MY CHURCH LAUGHING EVEN DAYS AFTER THE SHOW.. HE TALKED WITH US ABOUT HIS TESTIMONY WITH HIS WIFE... PASTOR BECKFORD SAID THAT THERE IS NO OTHER COMEDIAN HE WILL HAVE IN OUR CHURCH BUT FUNNYBONE.. HIS SONGS ARE VERY VERY VERY FUNNY..
We look forward to coming back to you with a whole new show in 2012. Praise GOD! Looking forward to coming back to be with each of YOU! With an inviting stage presence, Comedian FUNNYBONE get's the audience involved in his stand-up routine by telling stories with topics that are real and familiar. Funny stories about church, Pastors, mothers and Facebook are just some of the favorites; but scripture references inspire the crowd as well. FUNNYBONE has opened for CARLOS MENCIA, MARK CURRY, TONY ROCK, TOMMY CHUNG, TOMMY DAVIDSON AND MICHAEL WINSLOW! FUNNYBONE may not be a singer, but his original songs are truly entertaining! Songs entitled "Let's Pray Together" and "Go To Church With Me" are loved by congregation audiences, but at fund-raises and during motivational speaking engagement the crowds enjoy "Ruth Chris (steakhouse)" and "Mr. Metro (PCS) Man". 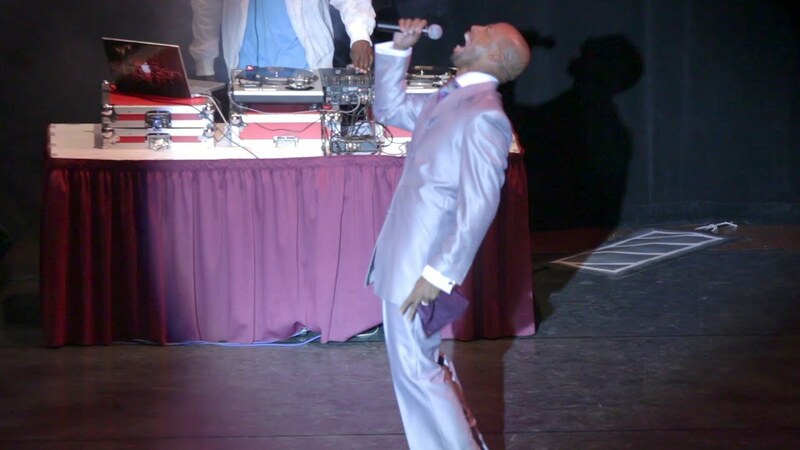 In his concert DVD entitled "Who Said Church Folk Can't Laugh", FUNNYBONE delivers a closing routine with angelic dancers, adorned with wings and absolutely leaves the audience asking for more! FUNNYBONE'S philosophy is based upon Proverbs 17:22 - A joyful heart is good medicine, but a crushed spirit dries up the bones. Come and have your heart feel the joy of a stand-up show from Comedian FUNNYBONE! FUNNYBONE is a Christian Comedian with experience, professionalism and a strong testimony to share with the world. During his heydays of traveling as a secular comedian, FUNNYBONE began to become unfaithful in his marriage. He felt that multiple women was the way a man feels like he’s a “real man”. As a result of being unfaithful, FUNNYBONE'S life began to fall apart in 2007 and he became separated from his wife. The separation from this wife was a catalyst for FUNNYBONE. "Watching my wife walk out the door did it for me", says FUNNYBONE. "I had lost my home and lost my family and it was at that moment that I realized that living the world's way was not the way I wanted to live. I wanted to live God's way". In February 2008, his wife filed for divorce while he was away from her. He understood and accepted her wishes and kept his faith. In March, the same year, FUNNYBONE made some changes in his life spiritually. FUNNYBONE dedicated his life to God and rededicated his comedy to offer a a faith-based, family-laced ministry to audiences. He realized that being separated from his wife was the best thing that could have happened to him at that time, because it drove him to a life dedicated to Christ. Through this transformation his wife recognized the changes in his life and cancelled the divorce. Now, she walks with him as he follows Christ and supports his comedy ministry every step of the way. On August 22, 2009, they renewed their marriage vows, making a new covenant with God and themselves and now minister together in their church and in their community. As his faith began to grow, God revealed to FUNNYBONE to bring his gift of comedy to his people, but in a different way, and he did. In February 2011, he spearheaded “The Jacksonville Clean Kings of Comedy Show”, which was a sold-out show at the Florida Times Union Center in Jacksonville, Fl. The show was a huge success and FUNNYBONE instantly knew that it was nobody but God to have brought him to this success; to have an ex-whore and ex-foul mouth in front of people on a large stage of this magnitude could ONLY be, but through the Grace of God. FUNNYBONE is currently preparing for his third annual show with "The Jacksonville Clean Kings of Comedy" and this year has been offered broadcast rights to air the show around the world! The Jericho Broadcast Network plans to air portions of the live show in late February 2012. "This show features local Duval county comedians, DJ's and Gospel Rappers", states FUNNYBONE. "So many of my local friends, family, co-workers and church family would ask to see me perform and I was always out of town doing shows at other churches and at community events. I decided to put on this local show just for them, and I brought other local comedians out as well". This year's show takes place February 11, 2012 and you may purchase tickets at Ticketmaster. FUNNYBONE has done hundreds of shows at churches and special events and was blessed to sign as a member of the “Holla! Comedy Tour” and was a host/comedian of the “TDI Gospel Jamz Tour 2011″. In 2011, Comedian FUNNYBONE was asked to be a co-host of a new TV show scheduled to air on a satellite station. "Working The Word with Prophetess Dee" included an interview with FUNNYBONE during one of the show's very first tapings! During subsequent episodes of the show, Comedian FUNNYBONE will provide a 4 minute comedy segment on the show and will even entertain the audience in between show tapings. During the "Working The Word Tour", Comedian FUNNYBONE will travel to various locations with the show and perform a complete comedy show for congregations and community leaders that attend the show taping. Music CD's and DVD's of past performances will also be available for attendees as well. To learn more about the "Working The Word" TV show or to book the show to come to your area, visit the Facebook page at Working The Word or follow them on twitter at WorkingTheWord2. Currently FUNNYBONE serves as the the host/comedian and Master of Ceremonies of the Tour That Angie BEE Presents. This Christian Rap concert tour features recording artists, motivational speakers and FUNNYBONE as each participant shares their musical and speaking gifts with audiences. They share their testimonies and their redeemed lives in Christ to a youth and young adult audience. Launching in Jacksonville, Florida in October 2011, tour artists travel from New York, Alabama, Georgian and Florida to bring the gospel of Jesus Christ to a variety of audiences. The Tour That Angie BEE Presents is scheduled to minister a one-week revival in Abuja, Nigeria at the Abounding Love Christian Fellowship Center which will take A FUNNYBONE Experience to a live International audience! Comedian FUNNYBONE has produced a few music CDs too! "Songs of Funnybone - Volume One" features songs entitled "My, My, My" and "Ruth Chris" that will have you Laughing Out Loud! "Songs of Funnybone - Volune Two" features "Cut The Grass" and "Go To Church With Me". FUNNYBONE'S musical contributions to comedy frequently mention members of his family and his faith and are enjoyed by listeners of all ages. Comedian FUNNYBONE also has concert and performance DVD's for sale, and portions of these projects will soon be available on his new website! "Albert FUNNYBONE Harris LIVE" and "Who Said, Church Folk Can't Laugh" DVD's are now also available. It' now time to Laugh Out Loud with a monthly issue of Comedian FUNNYBONE'S monthly newsletter! Each issue reflects pictures and stories from past performances. You may also hear the Laugh Out Loud moment from Comedian FUNNYBONE weekdays on The Hottest Home Hotspot WORLDWIDE syndicated radio show. Past segments of his jokes are now posted on YouTube on the Angie BEE Presents page and follow him on Twitter @ FunnyboneLoL and you can also read about FUNNYBONE in the pages of Pure Magazine. A wireless microphone is helpful for this stand up comedy routine as FUNNYBONE delivers to all aspects of the crowd. "I enjoy walking through the audience and engaging the crowd rather than standing onstage or at a podium". 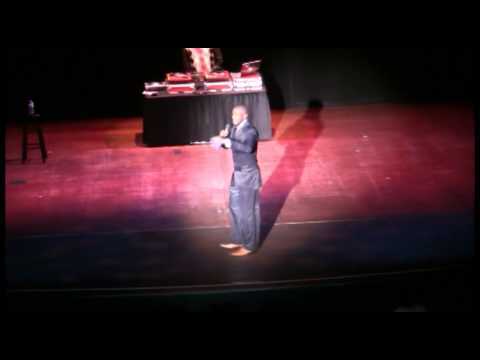 While on stage, FUNNYBONE enjoys having a center spotlight to follow him and if he brings a DJ with him for the stage a second spotlight should be provided for the DJ. In the dressing room, FUNNYBONE appreciates drinking water, hot tea with lemon and sugar and a plate of fresh fruit before the show. A heavy meal before showtime is discouraged but a plate afterwards is appreciated. FUNNYBONE travels with his wife, two sons and his management team (2 adults), so additional accommodations are requested. If you are providing overnight accommodations, two hotel rooms with double beds are requested. The management team can make these arrangements for you! Just contact Angie BEE Productions at 407-914-6519 to discuss which hotel rooms are in close proximity to your event! Finally, our management team doubles as our photography and videography crew, filming performances for DVD sales and broadcast segments. This team requires access to electricity and a merchandise table to secure DVD & CD sales. FUNNYBONE and his wife will be available to sign autographs and minister to attendees when they visit this merchandise area after the show. FUNNYBONE'S set list includes a stand-up comedy routine including original comedic songs and stories. When making a motivational presentation, FUNNYBONE'S set includes testimonial stories about his infidelity, incarceration and his life as a Christian and Armor Bearer for his Bishop. FUNNYBONE is currently the Master of Ceremonies for the tour that Angie BEE Presents and his duties include opening the show, introducing each of the tour artists and bringing them to the stage and keeping the crowd entertained and inspired as the show progresses. This tour allows FUNNYBONE to be presented before a youth and young adult crowd at churches, non-profit organizations and Boys & Girls Clubs across the country. This tour has even been invited to Abuja, Nigeria for a one-week revival. FUNNYBONE'S set can also include a personal touch as he has performed "roasts" of Pastors! Book FUNNYBONE to roast your husband, brother or father and watch the joy of the Lord appear before the audience. Funnybone started studying comedy under the leadership of Fred Pozin at the Comedy Zone in Jacksonville, FL in 2002. He grew up loving Richard Pryor and Eddie Murphy. He used to feel foul language was like seasoning to his jokes. Today, though, his goal is to bring joy to audiences – but without using foul language, like the men he idolized during his early years of comedy. Currently, Funnybone serves as Armor Bearer at Household of Faith Church in Jacksonville under the leadership of Bishop Lewis William. His greatest influences come from the teachings of our Lord and Savior Jesus Christ. A DJ (I can bring one if you don't have one) a microphone (wireless is preferred) and an audience that wants to laugh! I also enjoyed the "My, My, My' song. I enjoyed all of FUNNYBONE'S performance! I would pay $20 to see him again. Send me the newsletter. FUNNYBONE kept it real and GOOD! Who said Christians can't have fun? :) this was my first FUNNYBONE concert and I would pay $40 to see him in concert again. I enjoyed his songs and I would invite him to minister at my church or school event. Send me the newsletter! Besides his stories, my favorite part of FUNNYBONE'S performance was getting me to laugh so hard my stomach hurt. I would pay $50 to see him in concert again and I enjoyed his songs. Send me the newsletter! My favorite part of FUNNYBONE'S performance was the song. I would invite him to minister at my church or school event. Send me your newsletter! There was just so much that I enjoyed that I can't remember just one part. It was GOOD! I enjoyed his songs. This was my first FUNNYBONE concert and I would pay $200 to see him again! I enjoyed the roast of Pastor Alexander Trapp and the jokes about the dating website. I enjoyed FUNNYBONE'S songs! That was my favorite part of the show! Send me your newsletter! I enjoyed FUNNYBONE'S songs. I would invite hime to minister at my church or school event and my favorite part of his performance was ALL of it! My favorite part of FUNNYBONE'S performance was his impersonation of Pastors and being in the chat room with his mom. LOL! :) I would pay $100 to see FUNNYBONE in concert one more time. He has REAL talk! My favorite part of FUNNYBONE'S performance were the stories about getting a tattoo and about the whippings! This was my first FUNNYBONE concert and I enjoyed his songs.